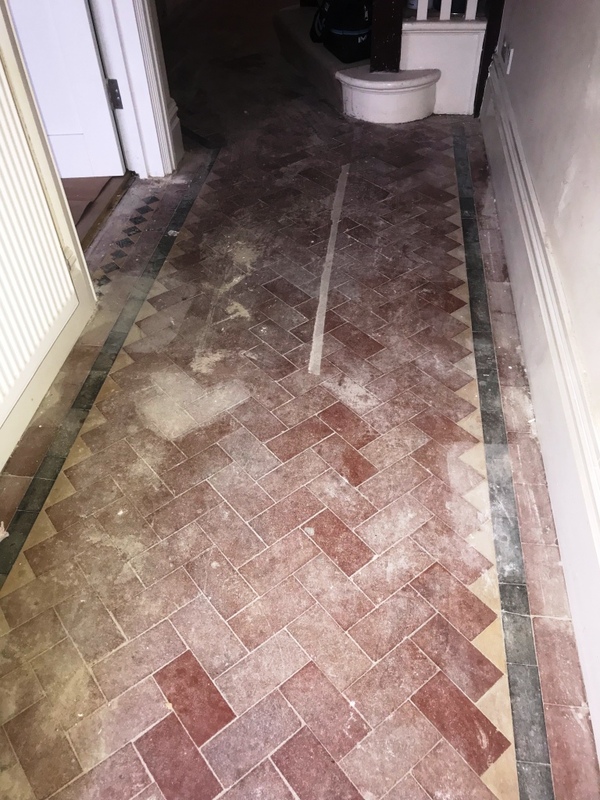 We were asked by the customer in Tooting, if we could restore this Victorian tiled hallway floor that they had found underneath a carpet while they were refurbishing their property. Interestingly he had already had a quote from another company, but they were unable to identify what type of tile it was. Old floors like these are not for the in-experienced and if you look closely at my website you will see I have published over 60 detailed accounts of tile cleaning and restorations since 2012. 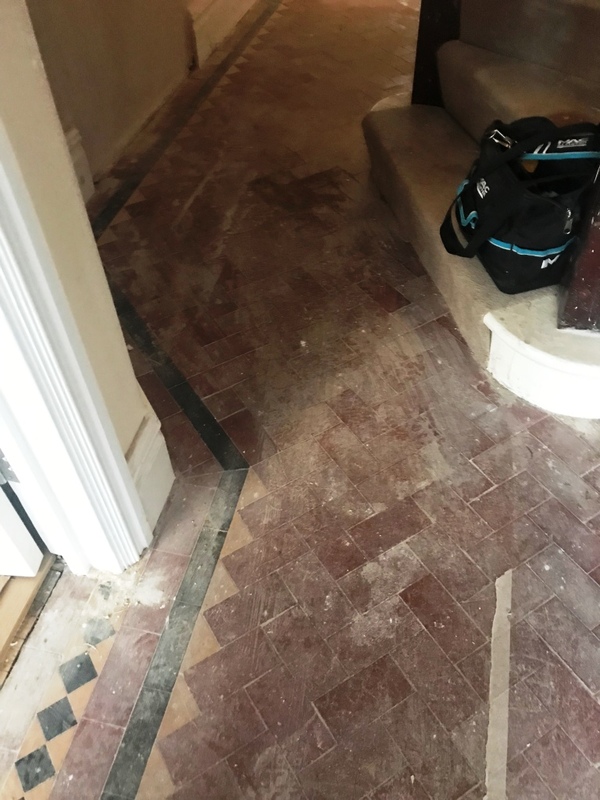 I could see there was a lovely Victorian Tiled floor hiding underneath the paint spots and plaster dust and carried out a test patch to show him what the floor would look like when it was clean. I also showed him pictures of similar floors that we have restored over the years and was able to show the finishes you can achieve from different sealers. Convinced I was the chap for the job he booked me in there and then. Returning on the agreed date we started the cleaning process by pre-wetting the floor with water. This was followed by the application of a strong dilution of Tile Doctor Remove and Go which was left to soak in for approximately ten minutes. This product is designed for the safe removal of old coating such as sealers from Tile, Stone and Grout and I knew it would be ideal for the task. 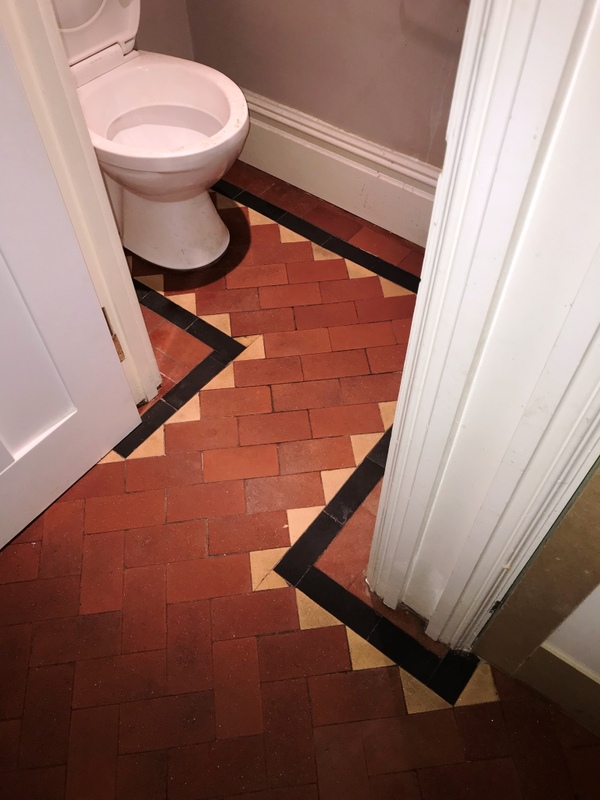 The solution was then scrubbed into the Victorian tile and gout using a rotary machine fitted with a black stripping pad. The scrubbing process released a lot of the stains and dirt from the floor which were then extracted with a wet vacuum. The process was then repeated until all the sections were treated. The floor was then rinsed with water and the resultant residue extracted using a wet vacuum before treating the tiles to an Acid Wash to neutralise any alkaline salts and remove mineral deposits and old grout smears. This was done by applying Tile Doctor Acid Gel for around fifteen minutes and then removing it with a final rinse. Cleaning the hallway took up most of the day and I needed the tiles to be dry before the next step of applying a sealer, so after discussing progress with the owner I left for the day and gave the floor three days to dry out. On our return I first checked the floor with a damp meter to make sure it had dried out thoroughly. All was well, so we proceeded to seal the tiles using Tile Doctor Colour Grow which is an impregnating sealer that leaves a matt finish and soaks into the pores of the tile protecting it from within and enhancing its appearance in the process. 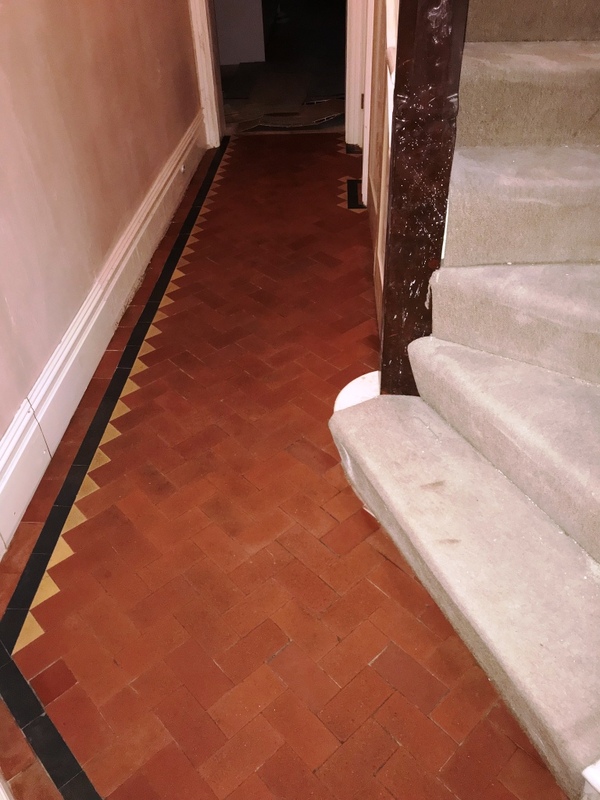 Four coats of sealer were needed and as you can see by the final pictures the hallway now looks fantastic and needless to say the customer was over the moon with the final results. 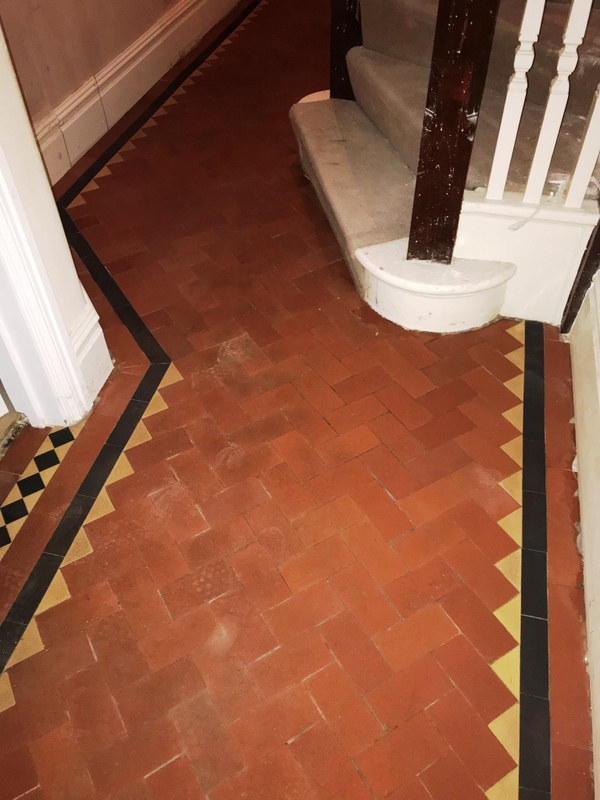 This entry was posted in Restoration, Restorative Cleaning, South London, tile cleaning, Tile Cleaning Activities, tile sealing, Tooting, Victorian Tiled Hallway, Work History by TileProf. Bookmark the permalink.